By Law No. 4 of 2013. the Dubai Government has relaxed the rules concerning who may notarise documents for official purposes. Before the law, only certain designated public officials could act as a Notary Public. These people are located in government buildings across Dubai (in Barsha, the Dubai Courts, Al Tuwar, Business Village and Hatta). However under the new law, Dubai Courts can grant licenses to UAE lawyers to act as ‘Private Notaries’ . Private Notaries can provide notary public service to the community in Dubai. 3. Verify the date of documents and contracts by assigning them consecutive numbers in the registers maintained for this purpose; record the date of their submission; and to sign and seal such documents with an official stamp. 4. Verify the signatures contracts of marriage between Non-Muslims and the documents issued by Churches and legal references licensed in the Emirate. 6. Perform any other competencies according to the applicable law in Dubai or which is entrusted to them by the Chief Justice or the Director of the Courts. Have a UAE law degree. Be a UAE national (however the Director of the Courts may exclude any Arab national from this condition, provided that his work experience as notary public is not be less than ten years). The UAE Government will shortly be authorizing a number of UAE licensed advocates to act as a Private Notaries for the purposes of Court Notary services. These advocates have undergone training courses and have sworn an oath before the Chief Justice of the Court. The local advocates will then, from their own private offices, offer the services of a Public Notary for the purposes of Court proceedings, initially under the supervision of the Dubai Courts. All Private Notary procedures and notarization processes will be done electronically through a dedicated website linked to the Dubai Court Notary. While lawyers can receive clients in their office and assist in the notarization, the process (including signature) will be performed electronically, and payment will be done electronically also. 2. To notarize any transaction related to the establishment, transfer, change or removal of a right of ownership or any right in-kind on a property. 3. To notarize or authenticate any transaction of which authentication or verification is under the competency of another authority. 4. To notarize or authenticate any transaction that includes a violation of applicable law, public order or public ethics. 5. To reveal to third parties any information which the Private Notary has acquired due to his position. 8. To provide any entity, with the exception of the concerned parties, with information from the registers, except with a written request by a judicial or governmental competent authority. 9. To authorize the signature of a federal or local government employee on a certificate, document or other paper signed in the course of carrying out their duties. In addition to the above, a Private Notary may not be engaged in any transaction if the person who requests the notarization is a relative or if the Private Notary has an interest in the matter. This is to avoid any conflict of interest. It is expected that the Notary services provided by Private Notaries will be launched in Dubai before the end of the year. So far, 21 Private Notaries have applied to provide this service throughout Dubai from a number of licensed law firms, including Al Tamimi & Co. Currently the service is only available in Dubai, though the notarization of documents by Private Notaries will be accepted throughout the UAE. 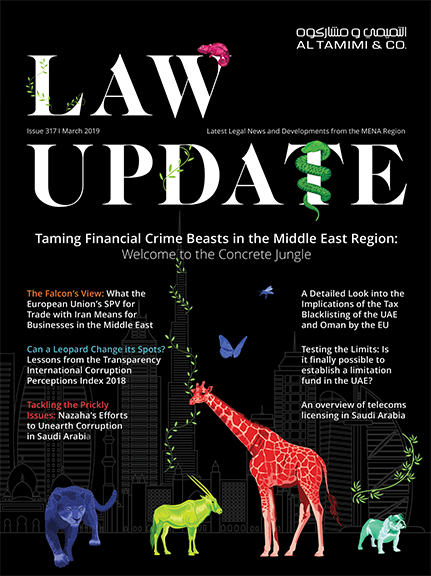 A similar provision to in the new Dubai law exists within the UAE Federal law system (see Federal Law No.4 of 2013). It is likely that a similar practice will be introduced on the Federal level in the future. The Private Notary service is one of Dubai’s recent initiatives to privatize certain sectors to make it convenient for the public to reach services that are essential to the public. This is in recognition of the growth of the city and its population and the need for these services to be provided more widely in the city.